I’m up early, walking on an dirt path as the sun rises. It’s an old railway bed turned bike track. You can tell from the grade, the way it eases into long, slow turns. Nothing else moves. The track skirts the edge of a sleepy town where I pass a string of closed grocery stores. At the edge of town the trail shoots off across wheat fields along a highway. I follow it until it disappears into an overgrown thicket. I try to fight through for a few hundred yards then ditch it for the road. I find a working water fountain around noon at the edge of a second town. I’ve been out of water all morning and I sit filling and drinking bottles for a half hour. A man comes by and tells me the fountain is only good for dogs. I shrug and fill my bottles anyway. All the stores are closed. I eat the last of my food, hummus and bread, on a bench before heading back to the old railway bed to lead me out of town. It turns into a dirt road and I follow it across more fields to the third town of the day. I find a mini-mercado open. It’s mostly junk food, but I buy a few donuts and a loaf of bread. I find water in a public park and sit out the late afternoon heat on a bench. A few cars honk at me as they pass. I find a second mini-mercado open on the way out of town and buy chips and a pair of oranges. The old railroad grade is gone. I lumber down a crowded highway, across the dried up mud of a flood plain, and back to a second highway following the river. The shoulder isn’t as good as I hoped, but at least it is there. I ditch it on and off for a parallel track that comes and goes. 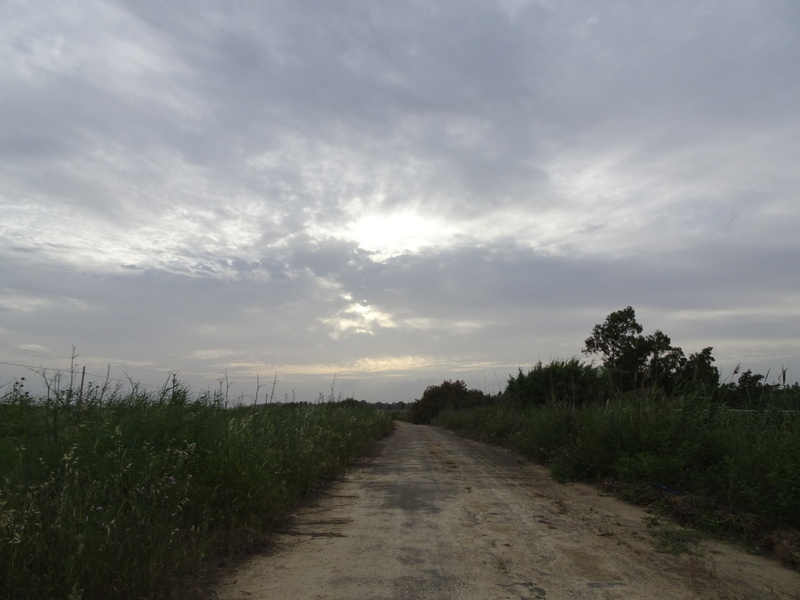 As the sun sets, I find a fourth town, skirt around its edge, and off into the fields on a dirt road. I find a patch of trees in the dark and roll out my tent to sleep. How many words did I say today? Maybe ten. Maybe twenty. Certainly less than miles. Some days you just have to pay your dues. Did I miss something? Where’s Daya? Sounds like a very productive day but one that will blur into a hundred others like it that were uneventful.